CYREN does not regulate repair of replication-induced DSBs. Representative images of chromosomes. Nature, 2017, 549(7673):548-552. Olaparib (AZD2281, Ku-0059436) purchased from Selleck. Clonogenic survival of cells expressing BARD1(WT)res or BARD1(AAE)res after treatment with olaparib or MMC. Data are means ± s.d., n = 3. EV, empty vector. P values were calculated using two-way ANOVA and multiple comparisons were corrected by the Bonferroni method. ** P < 0.01. Nature, 2017, 550(7676):360-365. Olaparib (AZD2281, Ku-0059436) purchased from Selleck. a, IC50 levels of olaparib in EWS–FLI1 mutant cells (n = 17) versus breast cancers (n = 13) or pan-cancer (n = 147) dataset. b, Cell viability of IMR90 and Ewing sarcoma cells with increasing doses of olaparib. Mean ± s.d., n = 3 technical replicates, one-way ANOVA compared to IMR90 cells. c, Cell viability plot demonstrating the role of EWS–FLI1 in mediating exquisite sensitivity to olaparib in U2OS cells transfected with either the oncogene or empty vector; n = 3 transfection replicates. Nature, 2018, 555(7696):387-391. Olaparib (AZD2281, Ku-0059436) purchased from Selleck. Western blot analysis showing PARylated proteins in cells subject to the indicated PARP inhibitor treatments (5 μM Olaparib and 10 μM NU1025). Cell, 2018, 172(3):439-453. Olaparib (AZD2281, Ku-0059436) purchased from Selleck. SAHA and olaparib synergistically induced apoptosis and compromised DNA repair in the sensitive HCC cells. Cells were treated with 0.5 uM SAHA, 3 uM olaparib alone or in combination for 48 hours, and protein extracts were subjected to western blot analysis with the indicated antibodies. Hepatology 2012 55, 1840-1851. Olaparib (AZD2281, Ku-0059436) purchased from Selleck. SAHA and olaparib synergistically induced apoptosis and compromised DNA repair in the sensitive HCC cells. Cells were treated with 0.5 uM SAHA, 3 uM olaparib alone or in combination for 24 (A) or 12 (B) hours, subjected to staining with propidium iodide (A) or FITC-Annexin V (B), and then analyzed by flow cytometry. Mechanism of FK866/olaparib synergy. FK866 exacerbates levels of gH2AX caused by olaparib. CAL51 cells were exposed to FK866 and/or olaparib for 48 h and cell lysates generated and immunoblotted for total and gH2AX. EMBO Mol Med 2012 4, 1087-1096. Olaparib (AZD2281, Ku-0059436) purchased from Selleck. Role of PARP and BER in the synergy between PTX and GMX in A549 cells. A) Cells were pre-treated +/- 1 uM olaparib (2h) then sequentially +/- 150nM PTX (24h) then +/- GMX 12nM (48h). Cells were harvested for (left) NAD+ quantification by LC-MS/MS (mean +/-SD of quadruplicates) or (right) viability by CellTiter-Glo (mean +/-SD of duplicates) B) PAR modification of proteins and γ-H2AX levels were measured in extracts treated as in A) by western blotting. Cancer Res 2014 74(21), 5948-54. Olaparib (AZD2281, Ku-0059436) purchased from Selleck. J Exp Clin Cancer Res 2013 32(1), 95. Olaparib (AZD2281, Ku-0059436) purchased from Selleck. (A) Representative confocal microscopy images of nuclear γ-H2AX (red) and DAPI (blue) staining in FKO1 cells 30 minutes following irradiation. Cells pre-treated for 24hr with 1μM NanoOlaparib, olaparib, or a vehicle control before irradiation. Mol Cancer Ther, 2017, 16(7):1279-1289. Olaparib (AZD2281, Ku-0059436) purchased from Selleck. 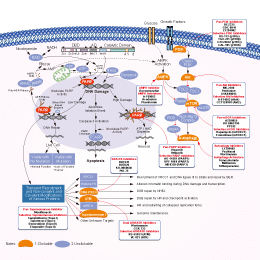 MSH3-deficient cells are sensitive to olaparib, a PARP inhibitor, and the combination with oxaliplatin. A, clonogenic survival of HCT11635, G5 without doxycycline (DOX), and G5 cells with doxycycline, which were treated with 2 μM of oxaliplatin, 2 μM of olaparib, and the combination of these two drugs. B, clonogenic survival of HT29 cells, which were treated with 1 μM oxaliplatin, 2 μM olaparib, and the combination of these two drugs. J Biol Chem 2011 286, 12157-12165. Olaparib (AZD2281, Ku-0059436) purchased from Selleck. Logarithmic growth curves of human Burkitt lymphoma cells over 5 days with 500 nmol/l of ABT-888 and AZD-2281 in combination with 0 Gy (a), 4 Gy (b), 8 Gy (c), and 12 Gy (d) of external beam radiation. The maximal relative reduction was 65.5% of viable cells and occurred with AZD-2281 (500 nmol/l) on day 5. DMSO, dimethyl sulfoxide. Nucl Med Commun 2011 32, 1046-51. Olaparib (AZD2281, Ku-0059436) purchased from Selleck. Number of foci detected using laser confocal microscopy and fluorescent Fluor 647 anti-H2A.X-phosphorylated (Ser139) antibody. Double-stranded breaks (red) are clearly augmented in cells incubated with 500 nmol/l of ABT-888 and 500 nmol/l of AZD-2281 compared with PBS and 1% dimethyl sulfoxide controls. Image analysis was performed using ImageJ and the ‘analyze particle’ function. Nucl Med Commun 2011 32, 1046–1051 . Olaparib (AZD2281, Ku-0059436) purchased from Selleck. Olaparib inhibited cell proliferation, and CRC cells with high XRCC2 expression had higher olaparib sensitivity. The surviving fractions of SW480 cells treated with (A) 1 mM, (B) 10 mM, and (C) 50 mM olaparib were measured using CCK-8. (D) The relation between cell viability and olaparib concentration. Medicine (Baltimore) 2014 93(28), e294. Olaparib (AZD2281, Ku-0059436) purchased from Selleck. in vivo suppression of PAR formation by the PARP inhibitor AZD2281 upon induction of DNA damage Primary human lung fibroblast cells (MRC-5) were pre-treated with the indicated concentration of the PARP inhibitor AZD2281 for two hours. Oxidative DNA damage was induced by 500 µM H2O2 for 10 min and cellular PARP activity was measured by immuno-staining of poly(ADP)-ribose (PAR) (right panels). The in vivo effect of PARP inhibition was compared to cells without DNA damage induction and inhibitor (control) and H2O2-treated cells without inhibitor. Average nuclear PAR staining intensities of more than 50 cells were statistically analysed by Kruskal-Wallis and the post-hoc Dunn’s Multiple Comparison tests (left panel). Asterisks indicate highly significant (p<1%) differences to H2O2-treated cells without PARP inhibitor. Thick horizontal bars mark medians and error bars the interquartile range. 2010 Dr. David Schrmann from University of Base. Olaparib (AZD2281, Ku-0059436) purchased from Selleck. Effect of AZD 2281 on the viability of endometrial cancer cell line Hec50 and Ishikawa and ovarian cancer cell line SKOV3,Caov3 and PA-1 was detected by WST-1 method after 3 days treatment. 2010 Dr. Xiangbing Meng of University of Iowa. Olaparib (AZD2281, Ku-0059436) purchased from Selleck. A potent PARP inhibitor (currently in late stage clinical trials). To columns 1 through 10, 1 μL of Olaparib (in DMSO) is added, and 1 μL DMSO only is added to the positive (POS) and negative (NEG) control wells (columns 11 and 12, respectively) of a pretreated FlashPlate. PARP-1 is diluted 1:40 in buffer (buffer B: 10% glycerol (v/v), 25 mM HEPES, 12.5 mM MgCl2,50 mM KCl, 1 mM DTT, 0.01% NP-40 (v/v), pH 7.6) and 40 μL added to all 96 wells (final PARP-1 concentration in the assay is ~1 ng/μL). The plate is sealed and shaken at RT for 15 min. Following this, 10 μL of positive reaction mix (0.2 ng/μL of double-stranded oligonucleotide [M3/M4] DNA per well, 5 μM of NAD+ final assay concentration, and 0.075 μCi 3H-NAD+ per well) is added to the appropriate wells (columns 1-11). The negative reaction mix, lacking the DNA oligonucleotide, is added to column 12 (with the mean negative control value used as the background). The plate is resealed and shaken for a further 60 min at RT to allow the reaction to continue. Then, 50 μL of ice-cold acetic acid (30%) is added to each well to stop the reaction, and the plate is sealed and shaken for a further 60 min at RT. Tritiated signal bound to the FlashPlate is then determined in counts per minute (CPM) using the TopCount plate reader. The cytotoxicity of Olaparib is measured by clonogenic assay. Olaparib is dissolved in DMSO and diluted by culture media before use. The cells are seeded in six well plates and left to attach overnight. Then Olaparib is added at various concentrations and the cells are incubated for 7-14 days. After that the surviving colonies are counted for calculating the IC50. Animal Models: Brca1-/-;p53-/- mammary tumors are generated in K14cre;Brca1F/F;p53F/F mice. Menear KA, et al. J Med Chem, 2008, 51(20), 6581-6591. Evers B, et al, Clin Cancer Res, 2008, 14(12), 3916-3925. Rottenberg S, et al, Proc Natl Acad Sci U S A, 2008, 105(44), 17079-17084. Weston VJ, et al, Blood, 2010, 116(22), 4578-4587. How to prepare the solution of the compound (S1060) for in vivo study? We recommend the following formulation: 4% DMSO+30% PEG300+ 66%H2O. It is a clear solution and can be used for IP injection. I saw that the solubility of the compound for in vivo on the website had been changed, why the change has been made? For the formulation for in vivo, the compound dissolving in 15% Captisol (former solubility) is a suspension, and it is fine for oral gavage. And now, dissolving in 4% DMSO+30% PEG 300+ddH2O is a clear solution, and is for injection. How long can the chemical compound be stable in DMEM at 4 °C? The compound is stable in DMEM at 4 degree for one week. BMN 673 : Novel PARP inhibitor with IC50 of 0.58 nM. Also a potent inhibitor of PARP-2, but does not inhibit PARG and highly sensitive to PTEN mutation. 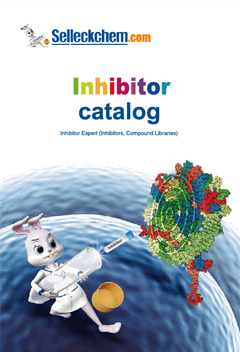 Features:The first PARP inhibitor used in clinical trials combined with temozolomide.